BAT - BLOG : BATMAN TOYS and COLLECTIBLES: Hey BATMAN Fans! PLANET COMICON 2013 in Kansas City, MO is This Weekend!! Hey BATMAN Fans! 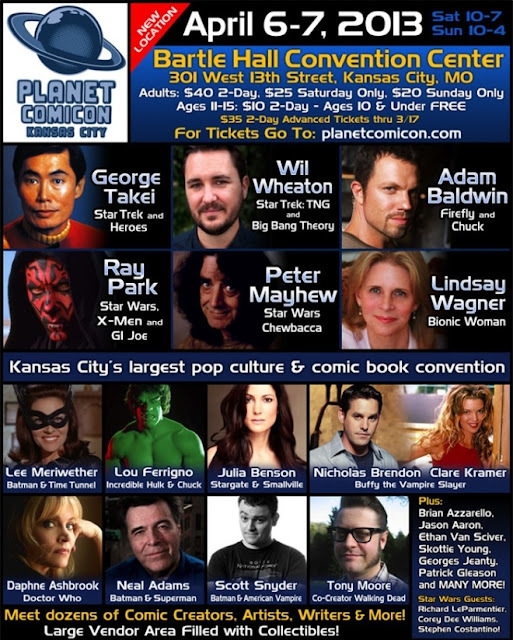 PLANET COMICON 2013 in Kansas City, MO is This Weekend!! Just a quick post to let a few Batman Fans know that PLANET COMICON 2013 in Kansas City, MO is this weekend. Now, why am I sort of hyping the "Batman" angle? Well, this show has a ton of people related to the character. First, we have Lee Meriwether, the Actress who played Catwoman in the 1960's BATMAN Movie. Then, there are a lot of Batman-related Comic Book Artists & Writers like Neal Adams, Scott Snyder, Brian Azzarello, Ethan Van Sciver, & more! Here's some basic info about the show up above, but for more detailed information please be sure to visit their official website, just CLICK HERE!